VALOR Fellows had a complete experience during Seminar VI: Bay/Northern Neck – Agriculture, Technology and the Environment. It was an exciting time bringing together firsthand the components of one of the most talked-about efforts in decades, allowing a vibrant agricultural industry and work in partnership to clean up the Chesapeake Bay. The Chesapeake Bay has experienced impact from centuries of civilization and wildlife, the cities and towns, individuals and industry. Agriculture is continuously referenced in these discussions, especially due to the land area it takes to have our industry survive. Over recent decades our industry has worked in partnership with environmental groups and governmental agencies to work to reverse the trend that became a norm. Though agriculture is one part, it is thought, for a cost benefit, that working to use agriculture through best management practices can achieve more “bang for the buck”. During our visit to the Northern Neck we were fortunate enough to visit and meet with Board members and staff from the Northern Neck Soil & Water Conservation District (NNSWCD). These are the folks that are the lynch pin in getting new and different practices in use in the areas most needed to help the Bay and water quality in general. Deadlines have been set by the Federal Government, and these folks help farmers find what will work best on their farm and improve water quality from non-point (farm) sources. The Virginia Agricultural BMP Program provides funds and/or state tax credits for the installation of conservation practices preventing soil erosion and runoff which contribute to water-quality degradation in streams, rivers and the Bay. These are typically in the form of a cost-share arrangement where the farmer pays part and the funds from state and federal government provide the rest. One of the most exciting educational tools the NNSWCD has developed is the Soil and Water Adventure Mobile. 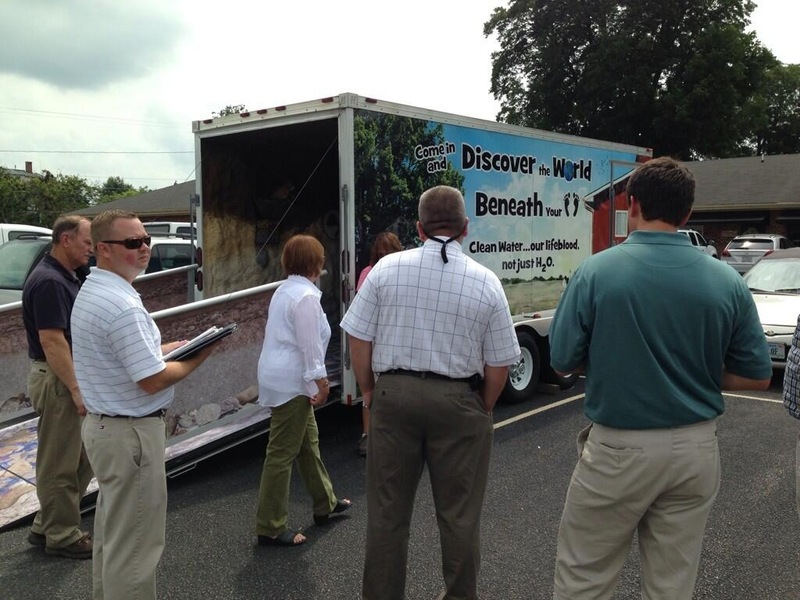 This trailer has been turned into an underground tour billed as “Come in and discover the World Beneath Your Feet”. VALOR Fellows agreed this was a wonderful way to communicate the soil ecology and the life it contains. Those from the Northern Neck Soil & Water Conservation District that talked to us were Junius C. (JC) Berger Director, Brandon Dillistin District Technical Manager, Sam Johnson Non-point Source Specialist, and Faye Andrashko Education /Public Relations Specialist. We also had the pleasure of being joined by Kendall Tyree Executive Director of the Virginia Association of Soil and Water Conservation Districts which provides and promotes leadership in the conservation of natural resources through stewardship and education programs. The VALOR Fellows would like to thank everyone with the Districts and Association for the outstanding educational opportunity during our visit to the Northern Neck.